Yes, I rushed off to buy Nanoblur a couple of months ago. I tried it under powder, I tried it over liquid make-up, I tried it on its own. Hated it with a passion, every single time. Nanoblur completely mattified everything, with the result of me instantly looking 15 uears older. No matter what I used with it, I looked awful. That’s $30 in the garbage, sadly. I had high hopes. Hydraluron from the same company is awesome! Give the ‘eyselix’ eye cream a whirl. I found a huge difference in a matter of weeks. Also I had nice improvement in my skin using the snoxin. Caroline Hirons from the UK gives a bit of a rundown if your interested. These Indeed Lab products have been available over there for ages. I’ve wanted to give eyselix a go too! I discovered Hydraluron from Caroline Hirons, and ever since discovering her my way of thinking of skincare has changed – in a good way! Get out of my head girl! I discovered Caroline through the Pixie-Woo girls. What a straight shooter she is and yes, my whole skin regime has been transformed as well and I can say hand on heart, my skin is so much better. Same!! I love her no-nonsense approach. I tell everyone I know about the genius that is Caroline. N A N O B LU R ! I N E E D Y O U ! A S A P ! I F N O T S O O N E R ! Oh what a coincidence, I just tried the Nanoblur for the first time today! And I gotta say, it was a huge miss… I followed the instructions and dabbed it on over my foundation, but it just looked awful. It made my foundation all blotchy and it actually emphasized my pores rather than hide them. I took it all off again and just now I tried mixing the Nanoblur with my foundation and then put it on, and while it looks better now, I still don’t think it looks the way it should. I don’t want to give up on it just yet though, so I will keep trying. When I was at Priceline I initially was drawn to the nambulor…yes because of the claims of looking 10 years younger …however the Priceline lady put me off saying she hadn’t seen any successful applications. Because of the 40% off sale there was another lady looking at it also and after we both tried it on our hands (she was probably in her 50’s and her hands looked a lot older ) after I said I didn’t want any she grabbed all the boxes that were available to use purely as hand cream! If u find a way it works can u update this please!!! Still would like to look 10 years younger lol!! I bought the eyeslix and snoxcin recently,spur of the moment purchase, during the Priceline 40% off sale. I’d never heard of any of the indeed lab products (when I came home I searched both products for reviews and have since found Caroline also and immediately wanted the hydralaun and was initially regretting the snoxcin purchase!) after almost 2 weeks of using them I can see differences and would recommend them both. The eyeslix is definately the best eye cream I have used and I have found the snoxcin has improved texture and my very distinctive age spots have definately become lighter even though it does not claim to reduce them however I am not using any other products that would reduce them! Very happy with the results after such a short time. After reading all the positive reviews on hydrolaun it’s on top of my wish list! I look forward to reading a review on the Avon mascara…I think it looks a lil awkward to use but you never know!! Awesome! Will definitely try the eye cream! The fab Caroline Hirens BeautyMouth blog directed me towards Hydraluron from this mob and it is freaking fantastic! My Ren moisturiser is lasting double the distance. Double. Swear to god. She’s not a fan of Nanoblur (I like that she’s not all in on one product, just like Zoe) but she’s more just your skincare lady. Happy to give a go. FYI – she reckons their eye cream is as good as any of the big brands – yet to give it a go but will report back on this post when I do. Haven’t tried Nanoblur as I just couldn’t get past the pricetag for what it essentially is and the idea of blurring my lines temporarily as opposed to reducing them/stopping them getting any deeper just seemed like a bit of a faff . However, while I passed on the Nanoblur, I DID pick up a tube of Hydraluron (after trawling through Boots in search of hyaluronic acid-y prodz) and it’s done wonders! After a long day at work and many hours of my face eating up all my make up (oh snap! ), a look in the mirror (usually avoided at all costs at that point in the day) of late has me pleasantly surprised. Skin is soft and lovely and has a bit of a glow goin’ on! I feel that with continual use of this bad boy, I won’t be needing to blur anything. Keen to try the eye one next – I’m naughty and can’t usually be bothered with a separate eye cream…but if my skin digs it as much as Hydraluron, I’m not going to fight it! Ok – this product baffles me. I jus could not get it to work over makeup. The consistency is like glue, it takes a lifetime to pat in … I’m just not sold. I do love their Hydraluron and Eyesilix though! fruitybeauty | The sorcery of POST-makeup line fillers and complexion perfecters. 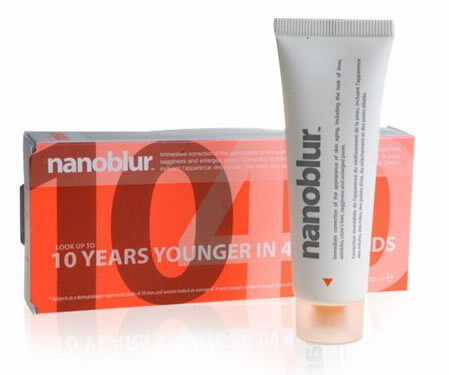 I have found the trick with nanoblur is to mix it in with my moisturizer or foundation or BB cream BEFORE applying. WOW! what a difference it makes to how my complexion looks, and when mixed with foundation or BB it stays in place and radiant all day. I would urge anyone who has been frustrated with nanoblur and not using it because of this to give this technique a try.